KIEV, Ukraine -- NATO's top military commander, General Philip Breedlove, said he does not think Russia will invade Ukraine, adding that the Kremlin has other ways to achieve its goals. 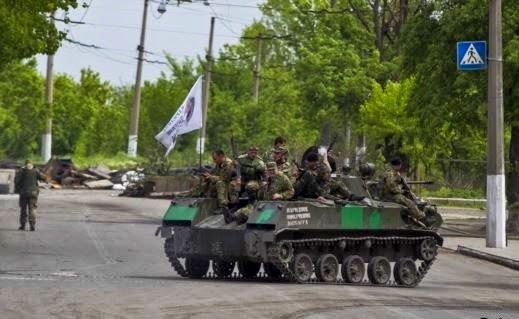 Pro-Russian armed men ride on top of an armored personnel carrier near the town of Slovyansk, May 5, 2014. Breedlove told an audience in Ottawa, Canada Monday that he thinks Russian President Vladimir Putin will keep doing what he is doing - creating unrest, discrediting the Ukrainian government and stirring up a separatist movement. He predicted Moscow will keep a hold on eastern Ukraine without sending regular troops across the border. The NATO commander said he is certain Russian special forces are in Ukraine. But he said it is not known if they were the ones who shot down three Ukrainian helicopters with missiles last week. Earlier Monday, Ukrainian government forces fought gun battles with pro-Russian militants in the separatist-controlled eastern Ukrainian city of Slovyansk, a day after pro-Russian protesters stormed the police station in the southern city of Odessa. Six people have been killed and around 100 wounded, said a Ukraine Security Service spokeswoman. Also, a Ukrainian military helicopter was shot down near Slovyansk on Monday, but the pilots survived, Ukraine’s Defense Ministry said. The helicopter, which came under fire from a heavy machine gun, crashed into a river. The ministry said in a statement the crew were evacuated to a nearby camp but did not give any detail of their condition. At least three other helicopters have been shot down by pro-Russian rebels in recent days. Separately, Kiev drafted police special forces to the southwestern port city of Odessa to halt a feared westward spread of the separatist rebellion. Ukrainian authorities said the Odessa force would replace local police who had failed to tackle rebel actions over the weekend. Its dispatch was a clear signal from Kiev that, while dealing with the rebellion in the east, it would vigorously resist any sign of a slide to a broader civil war. Meanwhile, Russia has called on the Kiev government on Monday to stop using armed force against its people and enter talks aimed at resolving the Ukraine crisis. The Foreign Ministry said in a statement that a humanitarian crisis was looming in blockaded towns in eastern Ukraine, where Ukrainian forces have been trying to dislodge pro-Russian separatists who have occupied official buildings. Ukraine and the West blame Russia for the violence, accusing it of direct involvement in an effort to destabilize Ukraine, a charge Moscow denies. On Sunday in Odessa, hundreds of pro-Russian militants used a battering ram on one entrance to the police station before pushing their way in through a garage. Authorities freed more nearly 70 of the 150 people arrested two days earlier during clashes that led to a fire which killed 42 mostly pro-Russian activists. Ukraine's prime minister, Arseniy Yatsenyuk, visited the port city Sunday, declaring Russia is seeking to destroy Ukraine by engineering clashes in eastern Ukraine and now Odessa. He accused Moscow of engaging in a "well-planned provocation" against the interim Kiev government. In Moscow, Kremlin spokesman Dmitri Peskov said Russian President Vladimir Putin had not yet decided how to respond to the offensive, or to the deaths in Odessa. Russia has suspended a 2001 agreement on mutual military inspections with Lithuania, the defense ministry said on Monday, amid growing worries in the Baltic region over Moscow's assertiveness in Ukraine. Under their agreement, Lithuania could inspect forces in Kaliningrad, a Russian exclave between Lithuania and Poland that is the headquarters of the Russian Baltic fleet, while Russia could do likewise with the Lithuanian military. The three Baltic states of Estonia, Latvia and Lithuania, all former Soviet republics with small military forces, have been warily watching Russia reasserting itself in its former dominions further south. A total of 600 U.S. troops have now been deployed to Poland and the Baltics for infantry exercises, where they are expected to remain on rotation until the end of the year. Last week, four British Royal Air Force Typhoon fighter jets also arrived in Lithuania, the first of 12 fighters that will boost air patrols in the Baltics. Russian President Vladimir Putin signed a law on Monday making the denial of Nazi crimes and distortion of the Soviet Union's role in World War II a criminal offense punishable by up to five years in jail. The law, described by critics as an attempt to curb freedom of expression to appease conservative Russians, Putin's main support base, also criminalizes the desecration of war memorials. The Kremlin has used World War II as a pillar to unite a society that Putin has said lost its moral bearings following the 1991 Soviet collapse. Russian officials and media have raised the specter of Nazi Germany repeatedly during Moscow's confrontation with the West over Ukraine, calling the overthrow of Russia-allied president Viktor Yanukovych in February a coup carried out in part by “neo-Nazi” forces. European Union officials gathered behind closed doors on Monday to confront the hard choices to be made for the EU to wean itself off Russian gas, even considering more use of polluting coal. A copy of the agenda for Monday's three-hour talks on energy security, according to Reuters listed debate on options such as increased use shale gas, better storage and a drive to reduce demand. Russia provides around a third of EU gas imports, roughly half of which is piped via Ukraine. On average, Russia gets $5 billion per month in revenue from gas exports to the EU. As a westerner I am proud to boast our principle of "freedom" of speech, expressing our opinions and balance views on matters, sadly this is not happening reading about this strange Ukrainian “civil war”, been living there myself for a while plus I have relations living both in East and West Ukraine, I am looking at both sides of the fence and honestly I can't distinguish the foes from the heroes, both sides are committed to atrocities, both sides information’s is just one side propaganda, both side have a witch hunt on journalist, unfortunately the current Kiev representatives appear the worst on the latest, maybe is the frustration on their inability to counter-act effectively Russian propaganda. The reality is that Journalist are threaten quite regularly. But the worst that I am witnesses this days is what the media has reported what happens in Odessa is quite different account of what my Ukrainian friends have told me (my friends have just a wish of peace and don't want a disunited Ukraine, and don't have any judgments on what side is worst or best) In that Odessa tragic building there were many bodies not burned, with signs of been killed prior to the burning, including a very shocking photo of a pregnant woman, this woman was a secretary (apparently) of a so called pro-Russian activist. Also they made an observation that burning of building is becoming a set standard for (and I quote) “covering up atrocities” is Mr Obama supportive of that? Is this now also our standards? Do people in USA have an idea of history in that part of the world? Is this wish to diminish Putin and Russian influence in that part of the world worth this violence and death, destroying what it was a peaceful society? The fear is that also is a waist of time and effort, the "orange" revolution should have learned many lessons, I am afraid did not, we going back to a hole again, failing the expectation of many young Ukrainians. The ultimate disaster would be to give Mr Putin a “morale ground”, it appears it is happening. Apparently you personally have no knowledge of region's history, and if you do, perhaps you simply ignore the fact that Ukrainian people would like for ones to be come truly independent and make its own choices. Ukraine and Ukrainians will make mistakes like any nation did in the past but, it will be its own mistakes and Ukrainians will be proud to know what real freedom is. Keep you pathetic pro-Russian propaganda to your friends in Kremlin.